Here is the list of 7 best sergers you can get in US for under $300. The list is strictly filtered on the basis of performance, features and price. Sergers are always essential for professional finish. 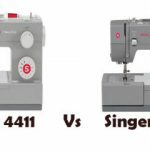 Choosing the right serger is always very confusing. Honestly, there are lot of crap machines out there. In fact I have seen some models from pretty popular brands in U.S not living up to the expectations. So you would be better of going model specific rather than being brand specific. Even the so called best serger brand is bound to have some low quality models. Here, I will try my level best to compile a list of 7 best sergers you can buy for under $300. 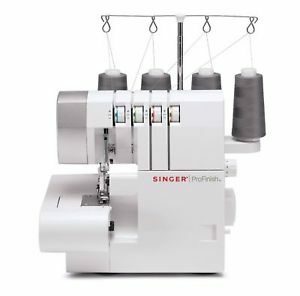 I have tried my hands on all 7 sergers in this list and these are the ones that I feel is the best out in the U.S market (of course in the under $300 price category). Out of the 20 sergers considered for selection, these are the 7 sergers that came on top in quality and performance. Initially, I was looking to make a list of 10 sergers, but later I found that only 7 met the quality standards I set. It would have been very easy for me to add 3 more ‘not so good’ sergers in the list, but that would be like cheating myself and my readers. “Flawless, absolutely flawless”, these are the words that come first in my mind whenever I think of Brother 1034D. It is a 3/4 thread serger. This has to be the most reliable serger you can get in US. It has a magical combination of great features, excellent performance and affordable price. 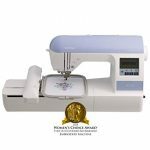 If you are going by the current price, this is the 3rd least expensive serger in this list. This one also has the highest ‘Customer Satisfaction Ratio’ ever recorded for a serger in US. 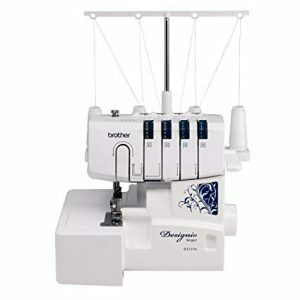 No other serger comes even close to the sales volume of Brother 1034D. The ease of use made this serger a beginners favorite. 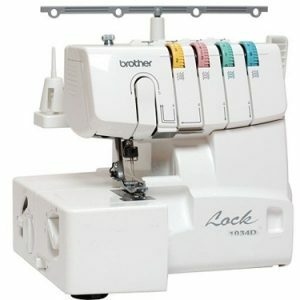 It has 22 built-in stitch functions, 4-thread overlock, 3-thread overlock, narrow, rolled hem, and ribbon lock stitches. Differential feed mechanism ensures consistent stitch quality throughout the project. It is free arm capable as well. Cons : Had a hard time finding one. This is copycat Brother 1034D. Feature wise, Brother DZ1234 is exactly the same as Brother 1034D. But DZ1234 is priced higher than (this may change according to shopping seasons) the previous machine because of the extra accessory package you get. If the extra accessory package means a lot to you, then you can go with this machine, but my recommendation will always be Brother 1034D. Because for me, the extra accessories doesn’t actually feel like it’s worth spending extra dollars. 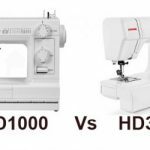 When I did the math, I found that if you buy those extra accessories separately along with 1034D serger, you still can save some money. Now you may ask why I put DZ1234 in the 2nd position. It is because of the quality and performance that it offers (it is not about money all the time, there will be instances in life where money will be nothing more than a piece of paper). Looking to sew denim or heavy-duty fabrics? 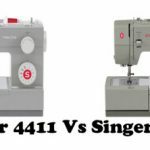 There is none better than Singer 14J250 for heavy-duty sewing. Its performance with denim is commendable. It goes through denim like a knife going through butter. It is sturdy and stable. 14J250 is a 2-3-4 thread serger. The differential feed mechanism does a wonderful job in eliminating stretching and puckering. There are 4 built-in rolled hems as well. Cons : Poor lighting. Threading requires a learning curve, no issues once you get the hang of it. Even though this serger is high on quality, it is high on price as well. 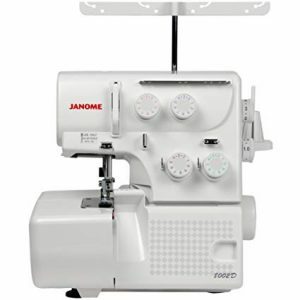 It has some nice features like 3 or 4 thread overlock stitching, built-in rolled hem, differential feed etc. It is one of the quietest sergers around. The operation is very smooth as well. The quality and performance of this serger is right up there with the best. Not a lot of people have bought this serger, but those who bought have all praises for it. Cons : Threading is slightly complicated. High price is something that drives people away from this machine. 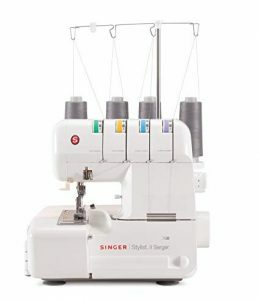 This is the most popular serger from Singer, mainly because of its low price tag. It has 2-3-4 thread capability, differential feed mechanism, 4 built-in rolled hems and is free arm capable. The stitches are smooth and consistent. Cons : One of the loudest sergers around. Flimsy spool holders. Even though this serger is not the very best you can get, it still is a pretty decent machine. 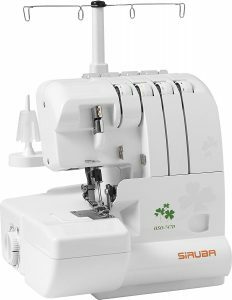 Siruba is not a popular serger brand in US, but this particular model is gaining popularity because of its very low price. 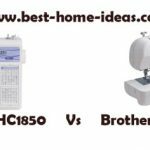 This is the least expensive serger in this list. It is not a bad machine for the price. The stitch quality is reasonable considering its price. But don’t expect too much from this machine. It has 3/4 thread capability, differential feed, free arm etc. It will be a good machine for basic stuffs. Cons : Poor warranty of just 1 year. The quality of plastic is not that great. User manual really needs some improvement. MO-50E is a very good quality serger. The stitch quality is pretty good and it works well with denim as well. 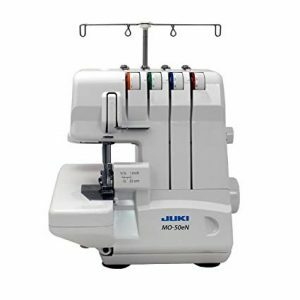 It is a 3/4 thread serger with lay-in tension and differential feed. Built-in rolled hemming feature is also there. The price is very reasonable when compared to other Juki sergers. Cons : Feature wise, I would have loved to see free arm option and a thread cutter on-board. There is no option to adjust the presser foot pressure as well. A combination of these limitations makes it look overpriced. This concludes the list of 7 Best Sergers Under $300. I hope this list has helped you make a decision.